You can hardly throw a game token ten feet without hitting a vintage arcade bar in certain Chicago neighborhoods. The barcade boom has been a boon for lovers of old consoles, and it’s also piqued people’s interest in new indie games created by up-and-coming developers (as evidenced by the popularity of the ten-player arcade console Killer Queen at Logan Arcade). 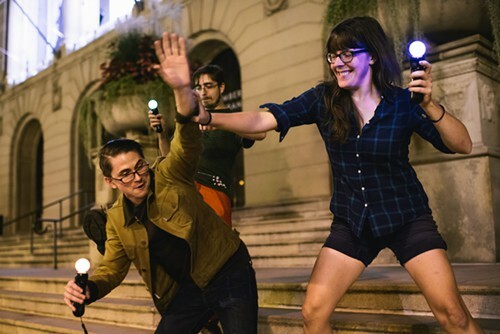 On September 6 at Bit Bash, Chicago’s first indie-gaming festival, it’s all cutting edge all the time. Rob Lach, another organizer, developer, and Indie City member, says the event is meant to showcase the fringes of game design, which are finding a home in Chicago. He pointed to studios such as the Young Horses, which came out of DePaul and released Octodad, or Cardboard Computer, which released the unorthodox narrative Kentucky Route Zero, as examples of great local talent. Bit Bash’s genesis came last March during a developers conference in San Francisco when a breakout session about throwing your own conference led to locals asking, then answering, the question “Why not Chicago?” Wiemeyer, who has success with the popular zombie satire game Organ Trail, which he says has moved more than 750,000 copies, feels the gaming scene here is practical yet filled with experimental studios since there’s a need to invest in your own smaller-scale ideas without the help of the big angel investors found in other tech hubs. Wiemeyer sees an event like this as a way to slowly build a community. Bit Bash runs from 2 PM to midnight on September 6 at Threadless HQ (1260 W. Madison). At 7 PM new games, live music, and beer from Arcade Brewery will be added to the mix. A $10 donation supports Chicago Loot Drop, which provides games and entertainment for local children’s hospitals.